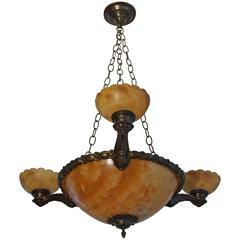 Stunning design alabaster and bronze light fixture. This stylish and sizeable French antique is an absolute joy to come home to. 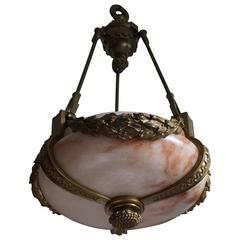 The unusually flat, but rounded alabaster shade in its magnificent bronze frame gives this unique light fixture its truly sophisticated look and feel. Thanks to its size and shape it will look marvelous in all kinds of rooms and in various types of interiors. 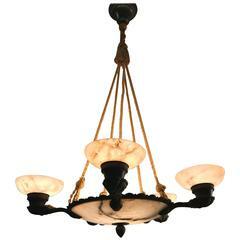 Also because of the top quality crafted, bronze chain and canopy this rare antique breathes nothing but class and finesse. If it wasn't for the old restoration to the natural cracks in the alabaster shade, this antique would have been worth at least double our price. It most certainly is worth our price, but if you need your antiques to be mint then we have many other light fixtures for you to choose from. This French work of beauty has been rewired for safe and immediate usage in the USA as well and if you appreciate it as much as we do then you will love our price. Also, because perfect packing & worldwide delivery from our store to your door in just 4 days are complimentary. Maximum height x diameter: 23.6 x 18.7 inches. We can shorten the chain to a height that is perfect for you and (thus) also create a flush mount. This currently is a single light pendant, but we can also provide a double socket if you would prefer that. Please read item description.